I’ve finally got hold of amaranth! After putting down my thoughts on healthy bread last week, I wanted to dedicate this week’s post to another health-related topic and highlight the benefits of the nutritious amaranth plant, its seeds and flour. The amaranth plant, once a staple of the Aztec and Inca diet, produces seeds packed full of protein and nutrients. Amaranth seeds contain even more protein than oats and are brimming with iron, calcium, vitamin B, magnesium and zinc. This is therefore another healthy bread recipe for the start of the year; my amaranth bread recipe based on long fermentation, enhanced in its nutritional value by added pumpkin seeds and walnuts. Amaranth is a member of the Chenopodiaceae family of plants which means it’s a relative of beets, spinach and quinoa. For this reason, some of its nutritional characteristics are more related to these vegetables than cereal grain foods, which are members of an entirely different plant family. The word ‘Amaranth’ is derived from the Greek term ‘amarantos’ meaning ‘unwithering’. Amaranth is also known as ‘Love-Lies-Bleeding’ due to its brightly coloured flowery head. Both amaranth seeds and flour can be used for baking. Due to its mild, nutty flavour amaranth flour produces relatively plain breads and I’ve enhanced my amaranth bread recipe with both pumpkin seeds and walnuts. If you fancy a quicker recipe, try these crackers for a healthy snack. I’ve seen the amaranth flavour described as ‘lightly reminiscent of corn with grassy tones’ which I think is pretty much spot on. Amaranth is quite versatile and can be simmered like other grains. It has a porridge-like texture and goes well with curry dishes. If you are growing the plant, you can even use the green leaves as an addition to your curry or salad. I’ve also used amaranth to prepare healthy salads and it works well. Alternatively, you can make a dessert by using amaranth seeds to prepare a fruity amaranth pudding. I got the amaranth flour and seeds from BuyWholefoodsOnline.co.uk, which has proven to be a brilliant source for high quality whole foods difficult to find elsewhere. My amaranth bread recipe includes 20% amaranth flour (based on overall flour content) and an additional portion of amaranth porridge made from amaranth seeds and water. 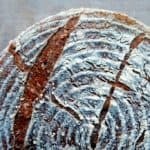 It is therefore not a pure amaranth flour bread recipe, but using around 20% amaranth flour in a loaf of bread will provide a good texture and the amaranth taste will come through nicely. 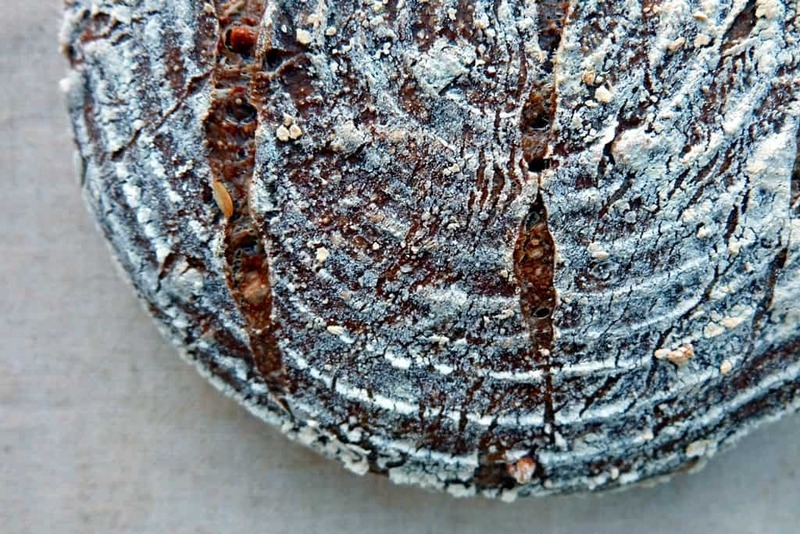 Combine the sourdough ingredients in a medium bowl, cover and set aside at room temperature for 16 - 24 hours. Dry-roast the chopped walnuts and pumpkin seeds until fragrant, then add 80g of boiling water to soak. Cover and set aside at room temperature for 16 - 24 hours. Toast the amaranth seeds in a small pan until they become aromatic and light brown. Add the water and bring to a low simmer. The amaranth should soften in about 15 minutes and the water should evaporate by then. If it dries before the seeds are ready, add more water as needed. Remove from the heat to cool when done. In a large bowl, combine 150g of the refreshed sourdough starter (the rest should be set aside for your next bake), the amaranth seed porridge and the main dough ingredients to form a dough. Knead for at least 10 minutes until you have formed an elastic and smooth dough. Add the seed and nut soaker from day 1 and kneed for a further few minutes. The dough will be slightly sticky, so work with your dough scraper to help things along. Place back into the bowl, cover and leave to rest for about an hour or two at room temperature until you can see the dough has risen slightly. Deflate the dough and give it another quick knead on your work surface. Shape into a loaf, cover with flour in a flour bath and place into a lightly floured proving basket. Cover with a polythene bag to protect the moisture and prove at room temperature. In my wintery Edinburgh kitchen, this process takes a good 6 or 7 hours. However, if your kitchen is warmer, the process may be much shorter. 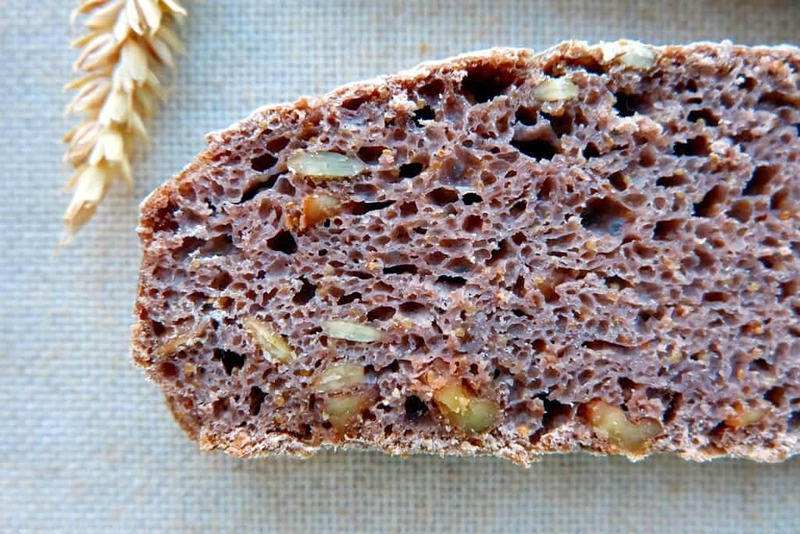 If you’d like to make this amaranth bread recipe without the use of pumpkin seeds and walnuts, you can simply omit the seed and nut soaker ingredients as well as step 4 above. 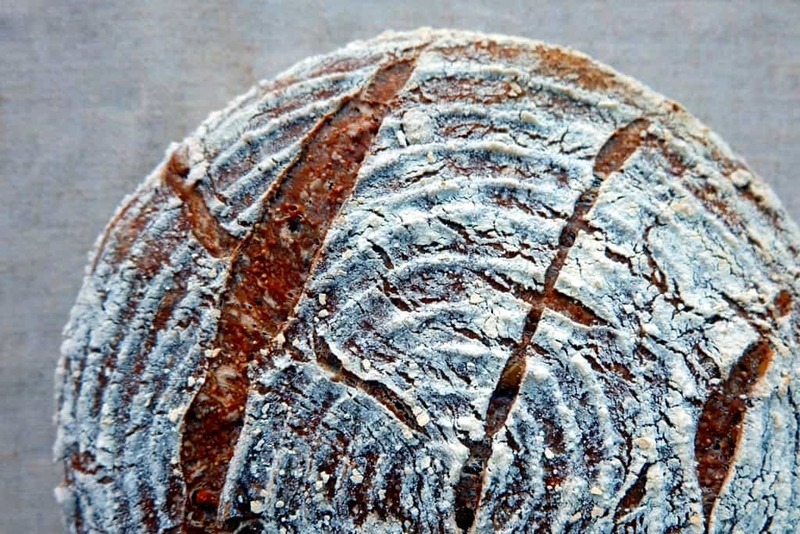 Next PostNext What to do with leftover sourdough starter?